We took Faith last night to see Mamma Mia on Fort Worth, so we didn't get home till quite late. This was the best I could do under the circumstances (and the fact that Ben ate for dinner the pasta salad I was going to give her for lunch). 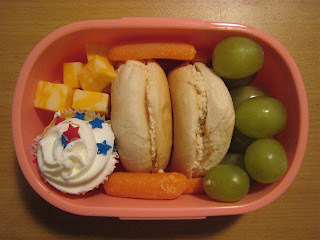 She had a toasted mini bagel with honey-almond cream cheese, carrot sticks, grapes, cheese cubes and a mini vanilla cupcake (from the huge stash I bought and froze right after July 4th). How did the frosting do after bein g frozen? I always freeze cupcakes unfrosted...never considered freezing them complete. The cupcakes were on clearance at SuperTarget on July 5th for something like $1.50 for 20 of them. I figured it was worth a try to freeze them and hope. The girl reports they taste just fine.